Dr. Truong is pleased to offer Paragon CRT contact lenses. 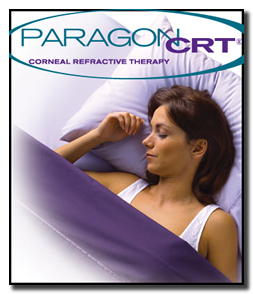 Paragon CRT (Corneal Refractive Therapy) is a specially designed contact lens that reshapes the cornea while you sleep. Is CRT new? The idea of corneal reshaping is not a new one, but Paragon CRT is the first therapeutic contact lens proven to work and proven safe for overnight wear. Is Paragon CRT permanent? No. If you stop wearing the lenses, your vision will return to how it was. How long does it take to start working? Most patients see dramatic improvement in the first few days and with complete vision correction in one to two weeks. Can I see while wearing my Paragon CRT? Absolutely! You can see with the lenses on or off so it you have to get up at night, no problem. How often should I replace my Paragon CRT lenses? About once a year when you receive your yearly comprehensive eye exam. ​If you think Paragon CRT may be just the thing you're looking for to get rid of your glasses and daytime contacts, then now is the time to do something about it. Call our office for more information or come in for a consultation appointment to see if you or your children are candidates for CRT!